This past weekend, I ventured beyond the Buckhead bubble and spent some time with friends and family all over town. While all of the outings were awesome, there were two I wanted to tell you about in more detail, since they are things you can enjoy now or in the future, too! 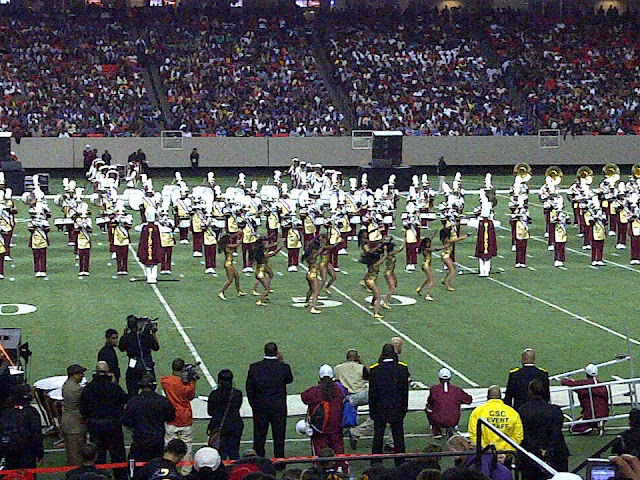 The first was the annual Honda Battle of the Bands at the Georgia Dome. Goooodness was this fun! V-103 DJ Ryan Cameron hosted the crowd for an afternoon of high-stepping marching band action from the Historically Black Colleges and Universities (HBCUs). Eight bands were selected for the wrap-up Invitational Showcase that my brother and I attended on Saturday, but many, many more bands were on tour throughout the Fall. Each band was anywhere from 50 to 200 members, and all came complete with their dance teams! The Dome was a riot for the 3+ hours of the show. An almost-sellout crowd was up on their feet dancing to the music, and when Bow Wow came out for the "half," I think some of the preteen girls almost died, they were screaming so loud. 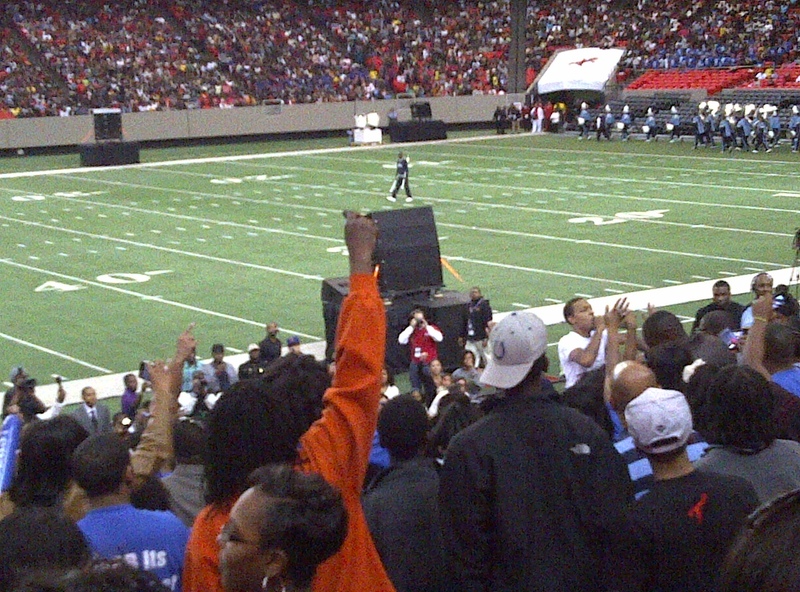 Check it out: Bow Wow, right there looking back towards us in the white-tee. He took it off later in the "show" LOL. Click through to see video from the concert. You won't hear the actual music, but you will get a sense of the extremity of awesomeness of their dancing at least. My fav? SCSU and their little 4 year old that started off with them -- he was auditioning this week for America's Got Talent! After the craziness that was the Georgia Dome, my Mom and I classed it up with an afternoon at the theater. But not just any theater! It was the new pop-up Pemberton Place downtown by the World of Coke and the GA Aquarium. 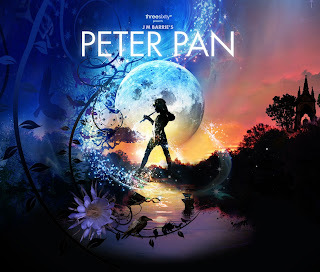 Peter Pan just opened last weekend in this 360-degree IMAX-meets-stage theater inside a tent, and we were lucky enough to get tickets to stop by for the matinee. So on a gorgeous January 31, we were treated not only to a fantastic show, but then were able to sit outside during intermission with champagne under a warm 65-degree sun. Note: It's unexpected weather like that here in Atlanta that makes me happy for being in the South. Sometimes. Check back with me in August, ugh. Peter Pan is in town through March 20, and I highly recommend stopping by for one of the performances. Besides the fun English accents of the actors, my favorite parts included the first time they broke out the IMAX screen (as they fly off to Neverland from the Nursery) and the manually-operated crocodile made out of hangers and closepins. What fun! The kids in the audience were totally captivated by the show, as were the adults, so it is definitely a show worthy of all ages (4 years and up -- some parts were loud or slightly scary). What did you do over the weekend? Anything out of the ordinary?